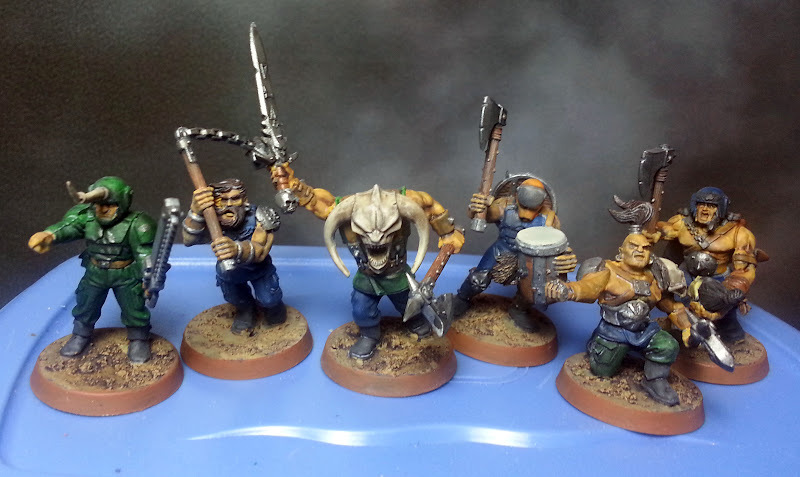 Here’s the first 6 Cultists I painted from a group of converted Traitor Guard I got off ebay. I got 26 of these guys (Imperial Guard converted into Traitor Guard) so that’ll bring me to 66 Cultists once they’re all done! Not many more required to max out two units of Cultists (35 per unit, I think). Airbrush priming & preshading really speeds things along – I’m down to about 30 minutes per guy, and they all have about 4-5 different colors on them. It’s pretty easy to finish 5 guys in a night, that’s including mold lines, priming and varnishing.